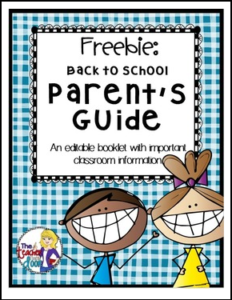 This Parent’s Guide is a great tool to give to parents at Back To School Night. It organizes important classroom information and serves as a handy reference guide. I love it because it also serves as a talking point tool for my Back To School speech. This Parent Guide is a Word Document, so you’re able to customize it to fit your own classroom’s needs.The five page handout can then be copied back to back and folded to create a mini-booklet for your student’s parents. To make the booklet, run the cover by itself. The next two pages are back to back: Getting to Know Miss Larson with Communication and also back to back are 5th Grade Curriculum with Grading, Daily Work and Homework. When you do it this way, the pages will be in order: Cover, Getting to Know _______, Communication, 5th Grade Curriculum, Grading, Discipline, Birthdays, Misc. Notes, Larsonease and the back cover (important numbers). Hope this helps! If you could take the time to give some feedback for this freebie, I would truly appreciate it! *** I love my followers! Please click on the star above to follow my store and receive updates on the latest resources.